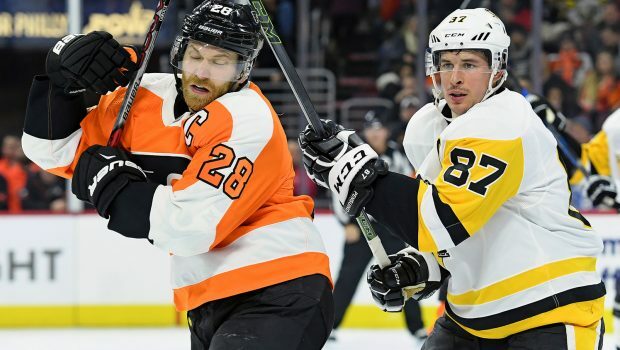 RED-HOT FLYERS SEEK REVENGE AGAINST THE SCUFFLING PENS! Remember last spring, when the Pens cleaned up on the hapless Flyers in the first round of the playoffs? How about a little role reversal! The surging Flyers host Pittsburgh Penguins at the Wells, and guess which team is struggling? It was Hart’s effort once again which catapulted the Flyers to another victory during this impressive stretch. Since their eight-game winning streak, the Penguins are 5-8-1 and have dropped four in a row. They have been without injured center Evgeni Malkin since Jan. 30 and he’s questionable to play against the Flyers. “I have nothing more to say about the power play,” Sullivan told reporters. Previous HERE’S PHILS OPENING DAY ROSTER WITHOUT MACHADO AND HARPER! Next PHILS CATCHER REALMUTO WILL WEAR DUTCH DAULTON’S NO. 10!